I'm always happy to find a graphic novel my 4th grader enjoys, and this one she found herself. 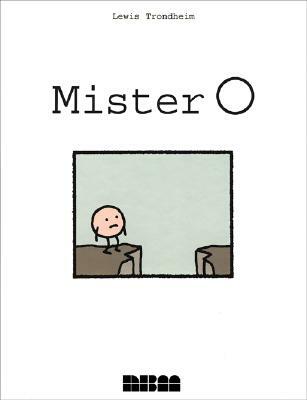 Mister O, by Lewis Trondheim (2004 NBM for English Edition) has a simple premise and plot. In each page, Mister O, a stick figure, has one goal: to cross a chasm. In each page, he fails spectacularly, despite his best efforts. He's ingenious and imaginative, resourceful and plucky, but all to no avail. His props don't work, the animals he recruits let him down (sometimes in horribly gross ways), and each time he meets the same terrible fate. The other stick figures he meets cross the chasm just fine. Despite this bleak premise, Mister O is very funny. Just as we eternally root for Charlie Brown and hope that Lucy doesn't pull away the ball this time, we hope against hope that Mister O makes it across the chasm. Thanks so much for the post on Mr. O- I placed a library hold immediately! Are you familiar with Robot Dreams, by Sarah Varon? It's a remarkable story (GN) with so many layers of emotion. Your daughter might like it too. Also, have you read Wonderstruck yet? (Brian Selznick's release in October). Hi Sandy, I have read both of those, and my daughter enjoyed them a lot too. I actually reviewed both of them too. If you know of any other GNs for this age group, I'd love to hear about them. Well, each page is a standalone comic. And sadly, he never makes it across.